"When Gianfranco Ianuzzi, the Creator and Artistic Director of the immersion told me, "Never lose a pixel! ", I knew that we had to preserve as many pixels as possible, some parts of the video content are 17000 x 1920 pixels and we were heavily relying on the lens shift feature since the projectors were to be mounted at very steep angles to achieve the maximum projection area." "We chose the EH503 because it offered the most complete set of features in that price range. The network feature especially came in handy and enabled us to change various parameters on all projectors at once." Challenge: To create an immersive audio visual display, projecting onto walls and floors spanning 1200m² that are not rendered, merging art with the viewer whilst incorporating some of the original power plant infrastructure into the mapped and blended finish. Solution: Kunstkraftwerk selected 55 Proscene Optoma projectors with short throw lenses and a full lens shift range to deliver an eye-catching dynamic visual composition of high contrast picture-perfect 1080p images. This was achieved by DLP® chip technology enabling a professional installation where virtually no maintenance is required. Results: Visitors come from far and wide to experience this immersive fusion of industrial archaeology and contemporary art. 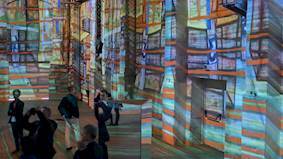 The projected images run continuously over 8 hours per day, 7 days per week, delivered by 55 ProScene Optoma projectors. Kunstkraftwerk wanted to create an immersive experience, merging the art and the viewer whilst incorporating some of the original features of the old power plant which was built in the 1860s as a gas plant for Leipzig’s homes and transportation. The space in the old factory building was left intentionally raw. No walls or floors have been rendered and, in every room a relic of the old factory preserved to place emphasis on the industrial past. This unconventional raw space posed a series of limitations when mounting a vast number of projectors in a challenging environment. In order to overcome this, a number of factors had to be considered in choosing the right projectors for the job: Brightness, reliability and flexibility were key but, that was not all, the projectors needed to be light in weight and offer adequate full lens shift on all lens options, including short throw, to enable images to be seamlessly blended. Kunstkraftwerk, Leipzig, Germany chose 33 EH503 full HD projectors combined with short throw lenses, 19 EH415ST short throw projectors and three EH500 5,200 lumens projectors. 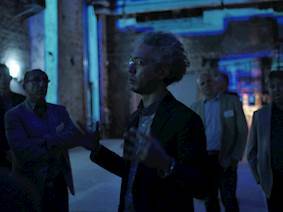 Coupled with Watchout multi display software media servers, images spanning 1200m² are projected onto the walls and floor of the old power plant building. The high brightness and exceptional colour integrity of these models contributed to vivid projection and seamless integration capable of real-time rendering with no delay. 1080p and 5200 lumens delivered bright crystal clear images which enhanced the immersive art projection. 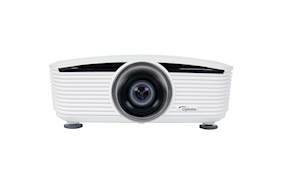 The EH503 projector delivered high resolution, high contrast picture-perfect 1080p images provided by DLP® chip which enabled a professional installation where virtually no maintenance is required. The EH503 is one of the very few projectors with a full lens shift range using a short throw lens. 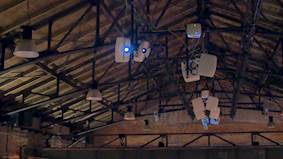 The throw ratio of the short lenses were crucial for the installation, where the mounting of the projectors had to work around the original infrastructural gas piping of the ceilings. The flexibility of mounting some of the projectors in portrait mode further aided the installation. In order to blend 55 projectors in real-time, the edge blending and colour matching tools were key features. 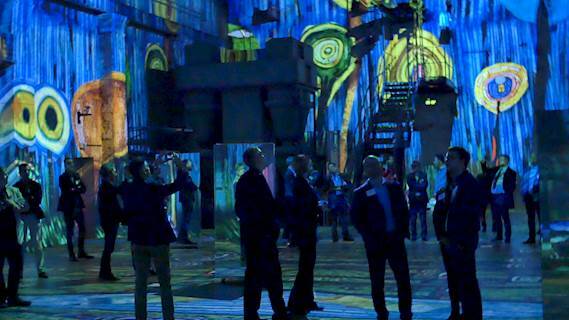 The Optoma ProScene team were on hand collaborating behind the scenes assisting with the creators of the content (The Immersive Art Factory) in order to achieve the flawless finished result. The system integration capability brings peace of mind as the network of continually operated projectors can be monitored over LAN and provide the user with any email message alerts should an error occur or a lamp fails or needs to be replaced. Visitors come from far and wide to experience this immersive fusion of industrial archeology and contemporary art. The projected images run continously over 8 hours per day, 7 days per week and are delivered by 55 ProScene Optoma projectors controlled with 17 independent PC’s that deliver real-time, seamlessly captivating imagery, which evoke a sense of wonder and industrial nostalgia.